Alex grew up living with his mother, grandfather and beloved older sister, Kate, and spending many summers in California with his father. No matter where he was, Alex was most at home outdoors and particularly loved fishing. Alex graduated from Cooperstown High School in 2005. He spent countless hours on the basketball court at the Clark Sports Center and was an accomplished swimmer and wrestler. He also shared his talents as a natural performer in school musicals and the senior play. During summers in his teenage years, Alex could be found stocking shelves at the Fly Creek General Store and, later, crafting pizza at Tino’s. In 2011, Alex started working as a biological observer on fishing vessels in the Bering Sea based out of Dutch Harbor, Alaska. Observers are responsible for collecting data on the catch of commercial fishing operations and documenting safety or harassment violations, as well as any mishandling of marine mammals or protected species. It is one of the most dangerous jobs in the world. Alex excelled in the challenging conditions, helped train new hires, and he was recognized as one of the most competent observers in the industry. He worked for Alaskan Observers, Inc. at first and most recently, as a lead field biologist for Saltwater Inc. The cause of Alex’s death is still under investigation by the City of Unalaska Department of Public Safety at this time. Alex’s infectious sense of humor, quick wit, engaging storytelling ability, cooking, honesty and compassion made him a favorite of crews and fellow observers alike. The fishing community will gather to hold a memorial service for him in Seattle later this spring. In between assignments at sea, Alex lived with his sister Kate in Denver, Colo., and enjoyed visiting friends in Vermont. He especially loved spending time at his friend Seth’s farm. Alex was also considering going back to school and becoming a high school history or English teacher. He was a voracious reader and always eager to discuss the mysteries and deeper meanings of both the human and natural world. Alex’s immense appetite for life will be sorely missed by his friends and family. He will be remembered as an adventurer, philosopher, fierce environmental steward, confidant, protector, sportsman, all around Renaissance Man, and never one to miss a party. In addition to his mother Jennie, father Roy, stepmother Carla, and his sister Kate and her fiancé, Eric Brenner, Alex is survived by his uncle Angus Mackie and his wife, Donna, of Cooperstown, and their children Morgan Segit and Kyle Mackie; his uncle Bill Mackie and his wife, Julie, of Salt Lake City, Utah, and their daughter Leska Haskell; his uncle Tom Mackie and his wife, Meg, of Sudbury, Mass., and their children Callie and Sam; his uncle Steven (Bo) Mackie and his wife, Martha, of Springfield, Va., and their children Sarah Schilling, Erin Van Buren and Joseph Mackie. He is also survived by family members in Homosassa, Fla., including his grandmother Svanhild Johannesen; his uncle John Johannesen and his wife, Cindy; his aunt Linda Bernardo and her husband, Tommy; and his aunt Grace Peters and her children Eric and Matthew. 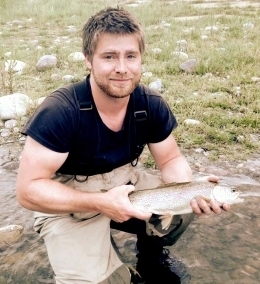 In lieu of flowers, the family has requested that donations be made in Alex’s memory to Trout Unlimited at www.tu.org.